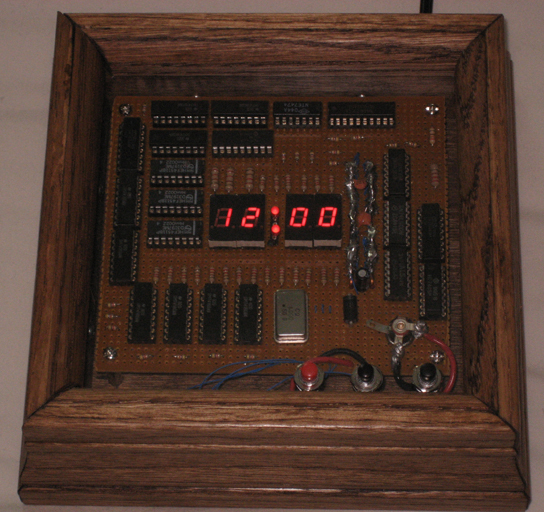 This is a working digital clock. I built it with the intention of hanging it on my wall, so I did my best to make it look nice. The case is made of oak trim. It is driven by a quartz oscillator, so it is very accurate. It's a 12-hour clock, with a light to indicate AM or PM. It can be easily set to any time with the three bottons in the bottom-right corner. While holding down the set button (the red button), pressing the hour button advanves the hour, and pressing the minute button advances the minute. For a complete schematic, click here. Looks so complicated but if you look to my code I bet you have the same feeling. Nice project!